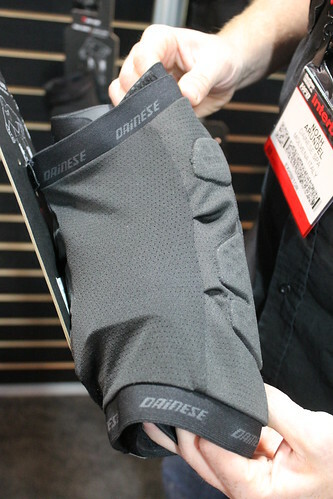 DAINESE FULL OF INNOVATION>BOA retention system (what you see on ski boots and road cycling shoes) in their new line of knee and elbow pads, they also added aluminum sliders ( this from the roadracing suits) on the knee and elbows to the OAK PRO Guards, and to top off the last of it DAINESE developed a new padding to absorb impact better to go with their newest pads. 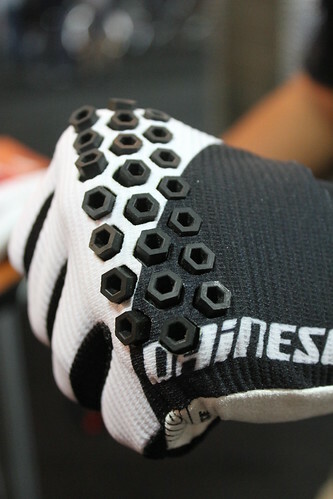 With the popularity of Enduro Racing most companies have come out with lighter pads as well as gear and DAINESE has done the same. 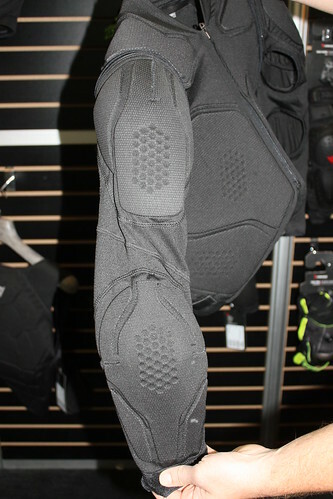 For the Enduro Racer or weekend worrier the new light weight TRAIL SKINS Knee and Elbow Guards incorporate the same PRO-SHAPE materials as the OAK series of pads, but lighter. Highly breathable as well as flexible one could only feel the air flow through them. 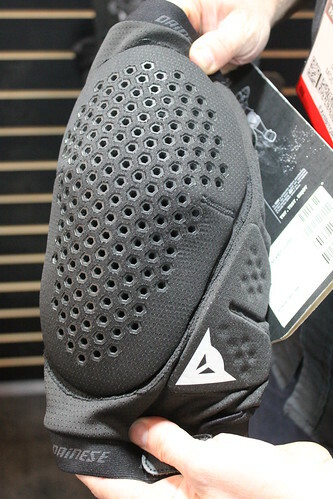 You will also see side impact protection as well. 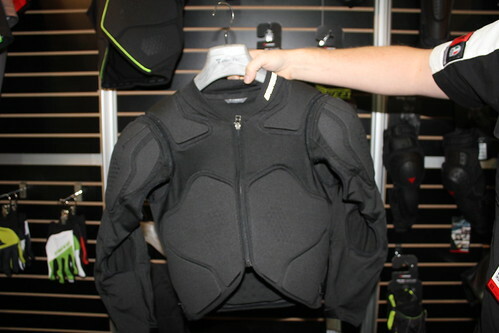 The new RHYOLITE JACKET SOFT has been updated for 2014 with added shoulder and elbow protected sleeves that can be removed. 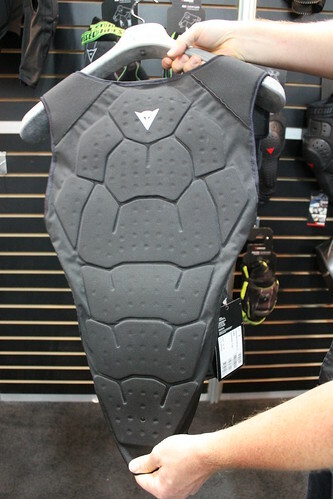 Back protection is the flexible Crash Absorb shape memory retention material (water-repellent elastic-visco nitrile rubber), along with PRO-SHAPE and Crash Absorb that is positioned in the front chest, side and abdomen areas. 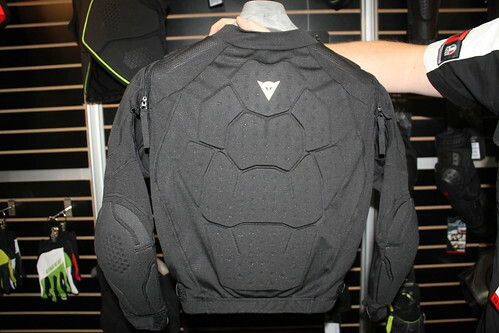 The jacket like the pads is fully breathable. The new Downhill Freeride line has changed as well. 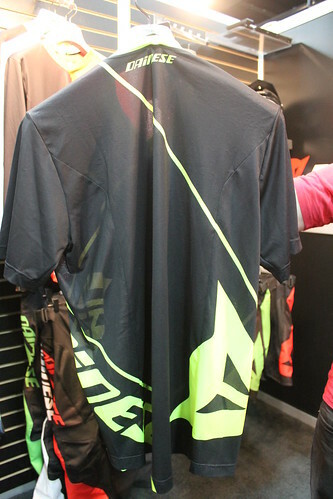 BASANITE jersey and HUCKER shorts are made with lighter materials and have more breath ability. If you look at the photo of the jersey from the back side you can see through it. 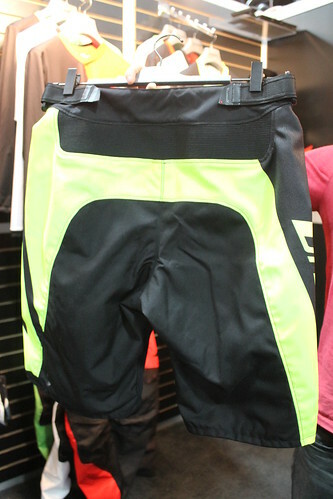 The shorts have nice big air panels to allow flow and comfort. 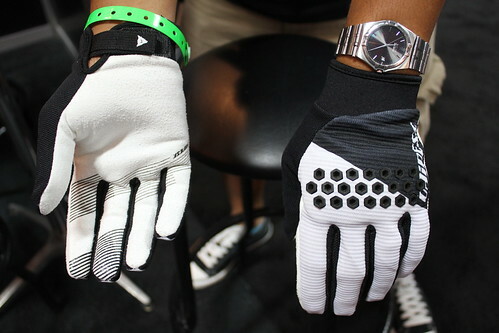 The new ROCK SOLID-D gloves caught my eye. They look like the ROCK SOLIDS, but have a added PRO-SHAPE panel to the knuckle area. They were quite comfortable on the hand and as you can see in the photo the PRO-SHAPE flexes nice to the hand. 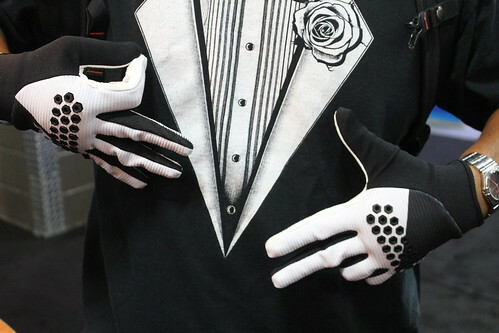 I don’t know what RL was trying to do here, but he made a nice hand model, plus his tux shirt matched the gloves. 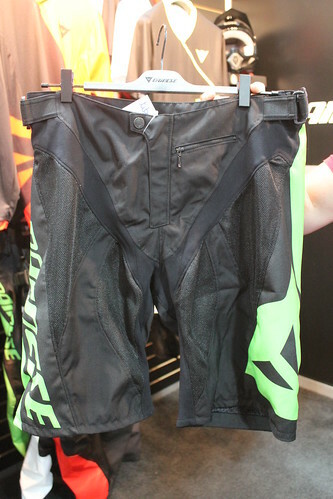 DAINESE also has a new PERFORMANCE Jacket as well as PERFORMANCE ARMOR that uses the new MANIS Back Protector, also DAINESE has their new Enduro/Trail jersey and short called the DRIFTER. More on this later. 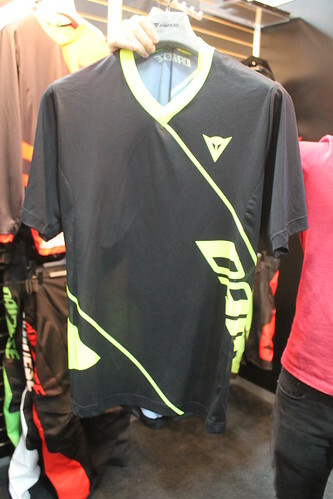 Look for DAINESE new gear soon. Thanks to DAINESE guys for the time. The guy wearing the gloves should be a “hand model”!